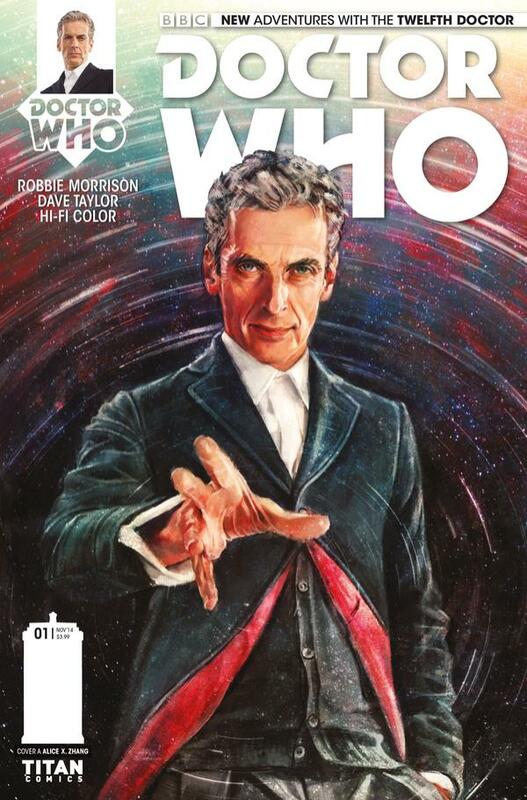 I was curious to try the launch of the Doctor Who: The Twelfth Doctor comic series, because I lost interest in the show in the second half of the Eleventh Doctor’s TV run. As a result, I haven’t seen any of the Peter Capaldi Doctor Who episodes. I thought the first issue, written by Robbie Morrison with art by Dave Taylor, might give me a good idea whether I should bother catching up. If driving interest in the master property is a valid measure of success, the comic worked. I’m curious enough — in large part due to the companion Clara and the lead’s attitude — to watch the show again. In the opening scene with the two of them, he’s willing to take Clara to another planet for skiing, but he refuses to join her, preferring to stay warm in the TARDIS. That kind of practical lack of emotionalism strikes me as a welcome change from some of the other recent versions of the character. He’s almost too much ahead of everyone else in this story, and I’m curious to see how long that can last. On the other hand, I can’t speak at all to whether this is an accurate translation of the characters to the page. There’s a lot that’s familiar, from the plot that starts with the Doctor promising a planet with certain characteristics, only to find that it’s now become the opposite, to the throwaway references to goofy, vaguely SF-sounding concepts (ice sharks?). Instead of snowy slopes, the two wind up in a bio-engineered tropical jungle. There’s an evil businessman, ignoring warnings of coming disaster for his own selfish purposes; the companion in danger, to be rescued by a gadget from the Doctor; anti-corporate moralizing; and an ignored warning from the Doctor of impending doom. All of these elements I’ve seen in previous Doctor Who stories, but it’s how they’re recombined that shows promise. And the images associated with them are of the type and scale that couldn’t easily be done on TV, playing to the strengths of the comic format, from the odd creatures to the giant alien threat. There are a number of throwaway wisecracks, too, which were hit-or-miss with me — I loved hearing once again about Venusian karate, and the wall-breaking sofa reference was cute, but I thought having yet someone else say “Doctor Who?” wasn’t necessary. The Doctor’s voice feels right to me, though, which is the important thing.